This retro chocolate recipe makes a great after-dinner treat that’s even better served with a dram of Irish whiskey. It’s very rich, so you only need a small slice to enjoy this treat. 1. Place the chocolate and butter in a heatproof glass bowl set over a pan of simmering water, making sure the bottom of the bowl doesn’t touch the water. Heat until melted and smooth. Add the milk and whiskey, stirring to a smooth consistency. Remove the bowl from the pan and allow to cool for 10 minutes. 2. Meanwhile, place the biscuits in a large ziplock bag and break them up using a rolling pin into coarse crumbs. Add the biscuit crumbs, cranberry and almond mix and the cocoa powder to the melted chocolate mixture and stir until combined. 3. Spread the mixture out on parchment paper and shape it into a log using a spatula. Roll up the paper and wrap it like a Christmas cracker, twisting the ends. 4. Place in the fridge for several hours, until firm. 5. After chilling, remove the log from the paper and dust it all over with icing sugar. Tie up with grease proof paper and coloured string for a festive feel, then allow guests to cut themselves a slice. 6. Keep in the fridge or freezer. If kept in the freezer, let it sit at room temperature for a few minutes before cutting or serving. 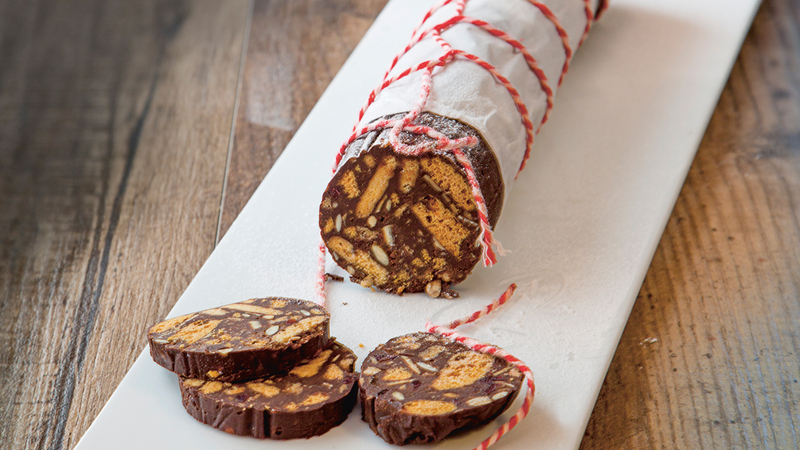 This chocolate salami treat can be kept wrapped in the fridge for up to two weeks, ready to serve with co­ffee for unexpected guests.